The BSP was formed in 1984 largely through the efforts of Kanshi Ram, who wanted the advancement of scheduled caste government employees. The All-India Backward and Minorities Employees Federation, formed by him in 1973, had a similar goal, but it did not make much headway. 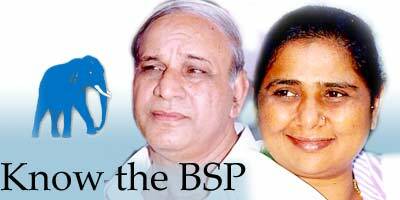 So Kanshi Ram formed the BSP with a presence in states like Punjab, Uttar Pradesh, Haryana and Madhya Pradesh. Kanshi Ram, who has retained the post even after two decades. The BSP is run primarily by Mayawati, Kanshi Ram's protégé, who occasionally consults her mentor. Although Mayawati is designated general secretary, she is virtually the working president with an ailing Kanshi Ram largely relegated to the background. Fifteen per cent of upper castes dominate the rest of the common people, the party says. It aims to break the 'upper caste oppression' by using state power to uplift the downtrodden. How is the party actually run? It will not be wide of the mark to say that the BSP is run with an iron grip by Mayawati, with occasional consultation with Kanshi Ram. She decides on the party strategy, to whom tickets should be given for the assembly and parliamentary polls, and how the party fund is to be collected. The BSP had 14 members in the 13th Lok Sabha and Mayawati used her party's strength craftily to get the utmost advantage from the National Democratic Alliance. It has not been able to realise its full potential despite highlighting that the bulk of the country's have-nots are being ruled by the so-called upper castes. Often, Mayawati has told her Dalit supporters that it is just a matter of time when the BSP will be ruling India because the overwhelming mass of the oppressed Bahujans are with it. Mayawati succeeded in heading the BSP-led coalition government in Uttar Pradesh after the last assembly election by marshalling the Dalits. The BSP's electoral performance disquieted the Samajwadi Party's Mulayam Singh Yadav. It is the BSP's aggressive moves that have made it a contender in UP politics along with the SP and BJP. With the growth of regional parties and the caste factor, the BSP can make further inroads in the country's political scenario. There is only one person who matters in the BSP, and that is Mayawati. There is no leader apart from her. She runs the party like her fiefdom. The ghost of the Taj Corridor scam continues to haunt her, although she has termed it as a conspiracy against her. She openly admits that she will go to any extent to fix archrival Mulayam Singh. Her party's greatest challenge is to keep its Dalit flock together. Although the traditional party voters are loath to vote for any other party, Mayawati's moods swings and authoritarian conduct is frowned upon by many in the BSP. She will also have to keep the promises that she has made to her supporters because the other parties are chalking out plans to woo Dalits. 1999: Cong's North India tally? one day BSP rule over india. and that day india become a forward nation like usa and uk . Copyright © 2004 rediff.com India Limited. All Rights Reserved.